We’ve been advocating for a rationalization of the Route 7, for several years now, and in light of this year’s service improvements, it’s time to look at how the case for Route 7 rationalization is stronger than ever. In brief, a problem of high-volume local east-west demand around the universities leads to service reliability problems, requiring duplicated service to make up for late buses. Duplicated service (i.e. empty buses following full ones) inflates the operating cost while increasing wait times. Rationalization of Route 7 represents an easy win to separate different demand patterns, providing better service for everyone at the same cost, while also minimizing “Bus Roulette” when the next bus cannot be easily predicted. Route 7 in the university area is a case where Human Transit might say that “‘transferring’ can be good for you and good for your city”. Demand in the university area is highly localized in nature. The overwhelming majority of riders are traveling east-west in the UW-to-King St corridor. In the animation above, we see a crush-load bus at Columbia and Philip (approx. 65 passengers) is reduced to 10 passengers by the time it arrives at King and University. These are riders that want the first bus that will take them to the mid-rises along Columbia, and the dense housing node centred at King and Hickory. Very few passengers are continuing south of University. The crush-load condition causes heavy delays at every stop along Columbia. 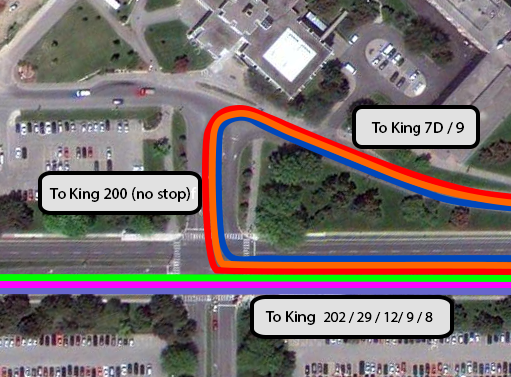 By the time the bus reaches King and University, the 7C from Conestoga Mall has caught up, resulting in one of the most common bus bunching situations in the city, the sight of multiple route 7 buses heading south on King. Despite a schedule of a bus every 7 minutes, the reality for much of the day is a pair of buses every 15 minutes, and once they are paired together, they must travel all the way to Charles Street Terminal in Kitchener before one goes out of service. This is duplicated effort for no return on our most important corridor. Let’s return to University Avenue. 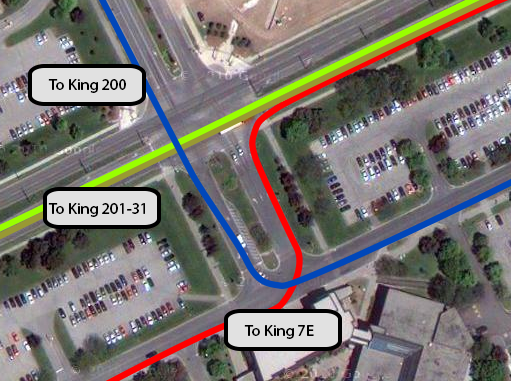 Two years ago, when we first approached this topic, there were already five routes running between King Street and the University of Waterloo: the 7, 8, 9, 12, and 200 iXpress. Today, we have an additional two, as the 29 has been extended to King, and the new 202 has been launched. A total of seven routes now run along the 1,200m between Seagram and Hazel. During the morning rush hour, from 8 to 9 am, a total of 36 buses are scheduled to run each direction on this stretch. 36 buses in an hour is enough for one every 100 seconds. In practice, there are gaps of several minutes, followed by several buses simultaneously, as these disparate services are unable to coordinate schedules. In practice GRT has needed to add unscheduled service to cover these gaps. In several locations, riders seeking to travel along the busy Columbia, University, or King corridors are faced with a dilemma over which bus they need to catch to get to their destination fastest. Without absolute knowledge of all bus schedules, this means picking a bus stop for one of several options, and watching helplessly as an equally acceptable alternate bus passes by, as it does not stop there. This problem is seen particularly at these three locations. To get to the node at King and University, one can choose either to wait for a half-hourly 7D, or cross the street, and catch the much more frequent University buses. Curiously, the 9 stops at both South Campus as well as University and Seagram, while the 7D does not. Those headed to Uptown must choose to either wait for the 7D, or take a frequent bus to King and University and transfer to a 7C. Picking the wrong stop results in watching equally acceptable options pass by. 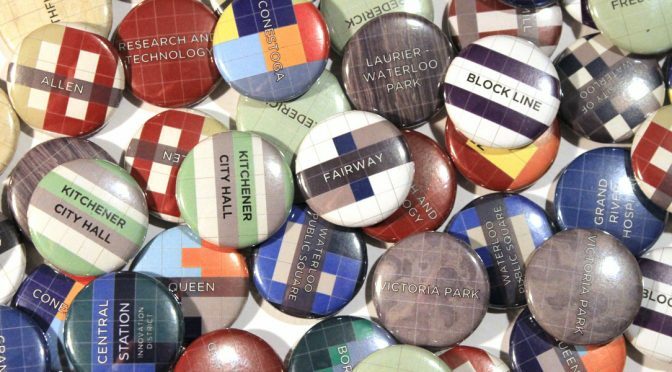 Consolidating all stops to Seagram and University would eliminate any question of where is best to catch a bus. Those traveling to the high-rise housing centred at King and Hickory would be equally served by any of the bus routes here, but must choose between one of three different bus stops. The 7E will take them closest, but only runs every half hour. The 31 and 201 gets you to King and Columbia, a short walk away, but the buses are only every 15 minutes and often leave simultaneously. The 200 is every 10 minutes, but requires the longest walk at the other end. None of these are clearly preferable. This serves to either crowd the 200 iXpress, or force people to rely on schedules despite buses on average every 6 minutes. Here, there are stops on opposite sides of Columbia for those wishing to go north to Conestoga Mall. To catch the 201, the stop is on the north, to catch the 7C, the stop is on the south. Better service to the mall would be served with both stops on the north side. Similarly, for those going to Uptown, the 7C stops on the north side of Columbia, while the 7E stops on the south side. 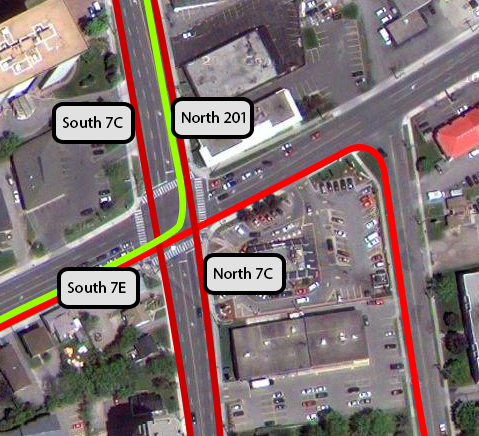 These are both route 7 buses, but they do not share a common stop until they reach University Ave.
We’ve already discussed a possible alternate vision for Route 7, which has been in part implemented already through ad-hoc service additions. GRT is able to provide better service for less money by unlinking east-west service from the north-south service to allow for predictable schedules, ensuring co-linear routes serve common stops to encourage use of extra capacity, and reducing bus bunching on our busiest corridor. This budget year, in the Budget Committee Agenda [pdf], GRT is hoping to achieve “$1,172,000 in cost savings and 15,100 [service] hours saved annually” (page 441). They have outlined a number of routes to be rationalized and a number of low-ridership trips removed as part of the effort to limit the property tax increase to 2.8% in the 2014 budget. The Region’s vision for Rapid Transit and intensification requires not just the trunk route, but a strong and competitive region-wide bus network. That is why we believe it is better to avoid cuts across the network by focusing efforts towards rationalizing duplicated service through strong predictable trunk routes that can form a frequent service network. Plausible and well-reasoned. Thanks! Another nice example of informed, constructive policy recommendations from TriTAG. This makes a ton of sense to me, as does the previous 2011 article. It’s too bad more of these proposals haven’t been taken up. I’ve lined up three different routes, going from King and Columbia towards UW, the 7E, 31, and 201. As you can see, buses are scheduled to arrive at precisely the same time, every half hour. The first bus to arrive picks up all the waiting passengers on Columbia, and falls off schedule due to crowding. The other two buses pick up a few stragglers, but otherwise represent wasted capacity. It takes 6 minutes on the schedule to go from King/Columbia to UW, and there are 33 trips where 3 buses are scheduled simultaneously. The extra two buses, on this short section alone, represent 7 hours a day of operating time that provides no benefit. That’s 1,400 hours, or up to $100,000 of expense per year. This is a non-trivial percent of the $1,000,000 of cuts GRT is being asked to find in its budget. By unlinking the 7E branch, many of these extra hours of service can be rescheduled to serve the area better, or adjusted to save space in GRT’s budget.